We are beginning our final day at the PPMA show! Not only have we already met so many of you who are interested in our products, it has also been exciting to be able to walk around and speak to other exhibitors who we could work with in the future, as well as seeing all of the brand-new technology that is becoming available. 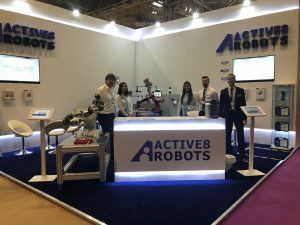 It’s been incredibly exciting to hear all the potential projects that could be just around the corner for Active8 Robots, some with big companies and others with small and medium sized enterprises. On top of this, it’s been brilliant to bump into some familiar faces; companies we have worked with in the past, and some we are currently working with. Our mini-factory cell, which removes and replaces the lid on a card-board box, has been a real success. It has perfectly demonstrated to any visitors exactly how we can integrate multiple brands of robot into one solution in order to create your bespoke solution. On top of this it shows how our end of arm tooling can work in a delicate manner, repeatedly moving the cardboard lid without damaging it. We can’t wait for our final day at PPMA today, just make sure you don’t cut any corners as you might end up missing our stand! If you want to chat about how we could help you, then any of the staff on our stand would be more than happy to take the time to talk with you, or if you’re just browsing for the future then make use of our interactive iPads and don’t forget to take a brochure.